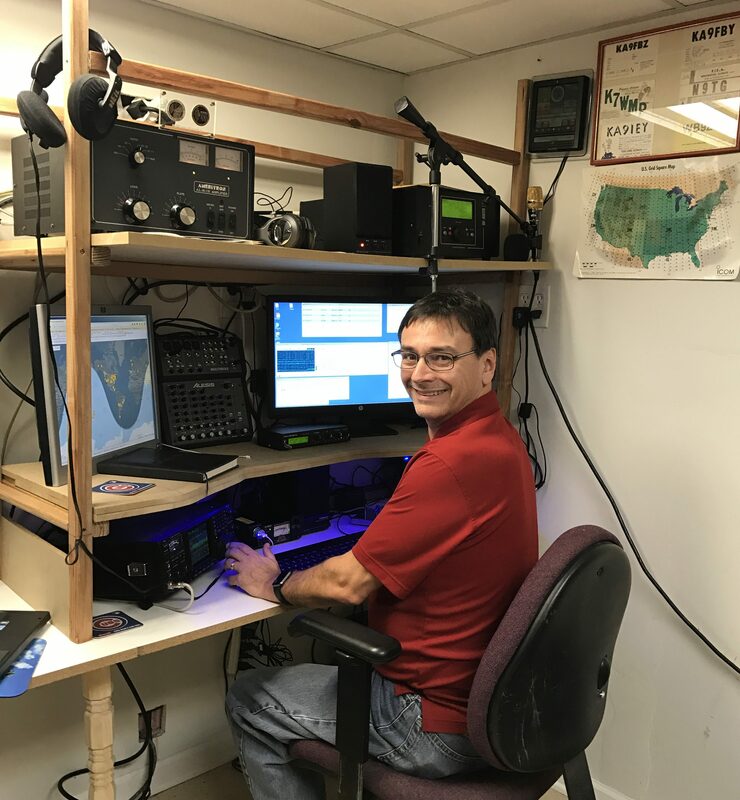 Welcome to the KU9Z Station Profile. My station has evolved greatly over the years. This current setup was my first real attempt at customizing the entire configuration. My focus was on ease of use during a contest as well as casual operating. Positioning the radio, keyboard, and Bencher paddles are all set for easy reach. Being right handed I needed the paddles on that side. Notice the notch in the second shelf to ease viewing of the radio and keyboard. It’s illuminated by a strip of LED’s. I can change the color and intensity to fit the operating mode or display style. The monitors and audio mixing board are set at eye level. I’m still experimenting with this and may swap the right screen and mixer. The mixer board allows me to further filter audio, especially handy on CW. Between radio and mixer I can really zero in on that weak one or signal buried amidst a flurry of CW. The mixer also let’s me pan left/right between different audio sources either on the headphones, speakers, or both. For instance I can listen to HF on the both sides, police scanner on the right, and In-House FRS on the right! Directly in front on the shelf is also the Microkeyer II. There’s a powered speaker at this level for times when I want to listen without headphones. Any station should have access to paper and pen no matter how computerized you have everything. And of course what station is complete without Chicago CUBS coasters! Top shelf includes the Ameritron 811H, Palstar HF-Auto tuner, and the second powered speaker. I also keep the Heil Pro headset, Goldline mic, and a second headset staged up there. The ICOM 756 Pro3 is the core of my station. It’s an older HF/6M rig, but is a total pleasure to operate. The band scope makes for easy hunting in contests; just look for the spikes on the scope and jump the pileup! 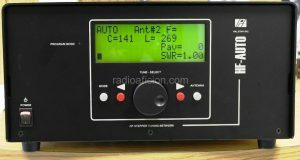 It’s also extremely handy when chasing that DX station running split. The scope can help you see where the folks are…and more importantly where they’re not! Filtering is extremely flexible. I find CW filtering to be far more effective than SSB. I can really knock down the interference between tight filtering and notching out adjacent signals. 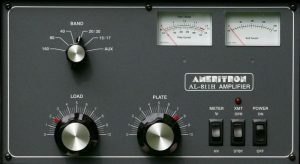 When a little more power is needed I rely on this Ameritron AL-811H. With 70-80 watts input you can deliver 600-800 output 10M-160M. I run mine on 120V and typically treat it gently. I rarely run more than 500W and the results are significant especially in contests. The Palstar HFAuto tuner is simply a beast. Real rollers, not micro-switches clicking and clacking, full power, and even remote control capable. It supports three antennas and is highly configurable to your tastes. I use the W1TR HFAuto Remote Control App to monitor tuner status when operating remote via TeamViewer.